How social traits evolve remains an open question in evolutionary biology. Two traits of particular interest are altruism (where an individual incurs a cost to help others) and spite (where an individual incurs a cost to harm others). Both traits should be evolutionarily disadvantageous because any benefits arising from these behaviours are also available to “cheaters” who do not pay the cost of displaying altruism or spite themselves. In this talk I will show how stochasticity can sometimes reverse the direction of evolution and drive the emergence of these behaviours. I will start with an individual-based evolutionary model and then approximate it using a system of stochastic differential equations (SDEs). These SDEs are then be reduced to a single SDE on a “slow manifold” governing the evolutionary dynamics. 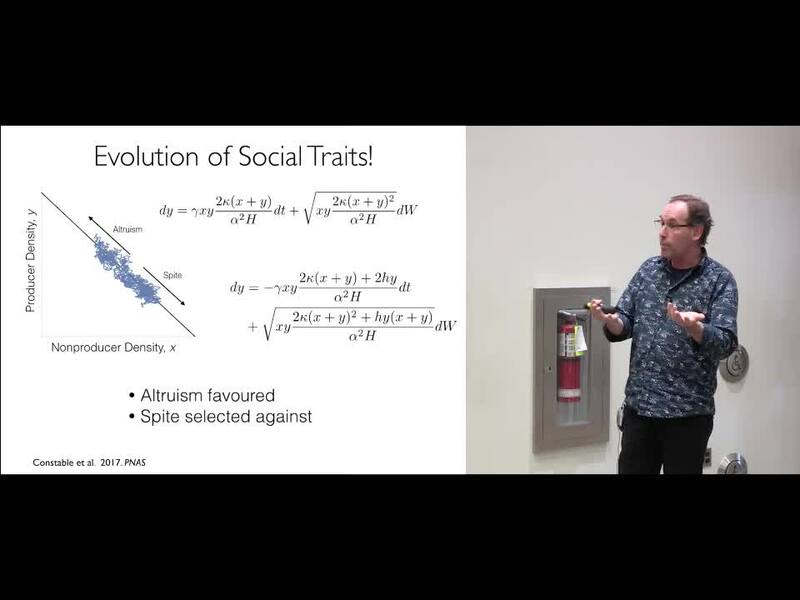 A rather complete analysis of this SDE is then possible, showing exactly when and how stochasticity can drive the evolution of altruism and spite. Biography: Tryo Day is a Professor and former CRC in the Department of Mathematics and Statistics at Queen’s University. His research interests involve evolutionary theory, including the evolution of pathogen virulence, drug resistance, social traits, and epigenetic inheritance. Dr. Day is coauthor (with James Stewart) of the textbooks “Biocalculus: Calculus, Probability and Statistics for the Life Sciences”, and (with Sarah P. Otto) “A Biologist’s Guide to Mathematical Modeling”. He is an Elected Fellow of the Royal Society of Canada and the AAAS, and is the recipient of a Killam Research Fellowship, a Steacie Fellowship, the CAIMS Research Prize, and the Steacie Prize.